Bicycle Repair Forums - BikeRide › General (Non-Repair) Topics › Bicycle Culture › Show off your bike! › New bike for g-baby! Found this old Raleigh 24" on CL for $30. Brought her home and cleaned and adjusted. Fits her great. Looks good and rides good. She is really excited about it . She has a bike like Pop's now! (It has drop's anyway,thats where the similarities end LOL) It is pretty heavy though. Looking for a MTB for her now. She and I are planning a ride on the C&O canal this summer and think a MTB or Hybrid will be best on that. 184 miles from Cumberland MD. to Georgetown DC. Probobly go a week or so. It really is a cool looking bike. Nice little bike, should get her by for a bit. For a style bike like that, that would be better equipped and lighter would be a "Mixte". I realized long ago that just about anywhere in the country there is a following or just some people that are in to them. 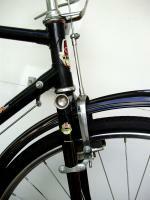 many brands offered them Like Miyata, Schwinn, Shogun, Motobecane. If I ever see one posted on the cheap I always go look at them. I usually do not touch them at all and properly describe them and post an ad with good pics and do a quik sell for a moderate price. I pulled two this last year from the garbage and sold them for $100, no problem. I picked one up a couple days ago for $20. It was posted as merely "Schwinn bicycle $20". I will not even wipe it off for a quik $80 profit. Not my cup of tea but who am I to question somebody else's cup. It is not very often I make $80 an hour to drive across town to get a bike.